The #Refo500atDET series (introduction and schedule here) intends to deliver posts on many of the important Reformation figures that we all know and love. And that, coincidentally, I’m sure you’ll be able to read about on many other blogs and websites during this period of festivity. However, we here at DET want to take a different tack here at the beginning of our celebration by highlighting the contributions of women to the Reformation. Although they are, traditionally, much less of a focus in recounting of the Reformation, those events would never have occurred if it had not been for courageous women of deep conviction working tirelessly and – far too often, thanklessly – in the background. And sometimes the foreground, too. So let’s kick off our celebrations by remembering and honoring some of their contributions! Five hundred years ago tomorrow, so the story goes, Martin Luther nailed his 95 Theses to the door of the Wittenberg castle church and inadvertently started the Protestant Reformation. Then the Swiss Reformers perfected it. Well, I’m as much for ecumenism and everything as the next Protestant systematic theologian, but – in my book - that right there is a reason to celebrate. And so we will! Over the next two weeks, DET’s contributors will treat you, gentle readers, to a series of posts celebrating the lives and achievements of important figures from the Reformation. We’ll be bringing all the best Reformation-historical goodness to you right through your favorite digital screen. Should we just give up on the whole “fortnight” thing? I mean, it’s been one week shy of two months since the last link post. What’s happened since then? First, my book on Helmut Gollwitzer’s political theology has come out! It is attractively priced with a retail hit of just south of $30 USD. But Book Depository has been selling it at a discount (21% as of when I’m writing this) and also providing free shipping worldwide. So, what are you waiting for?!?! Order your copy now! Second, DET contributor, Kathryn Heidelberger, published a review essay with The Christian Century entitled, Are Wendell Berry’s Port William stories about racism? What is theology even about? What is the telos of this intellectual practice? In the first chapter of his distinguished work of systematics, Gordon Kaufman succinctly situates his approach to theological method -- distinguishing it from three other common views of the discipline. In the Face of Mystery: A Constructive Theology, By Gordon F. Kaufman (Cambridge, MA: Harvard University Press, 1993). Nineteenth Question: Is the Roman pope the successor of Peter in a monarchy or ecumenical pontificate? We deny. 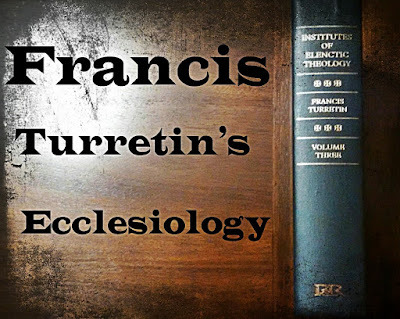 At every turn, we’ve seen Turretin leave open the theoretical possibility that Peter was accorded certain honors or excellences. But he has also consistently maintained that such things don’t translate into the sort of position and authority claimed by and for the pope in the early modern period. Here Turretin clarifies the logic that governs his thinking on this: “the pope cannot be the successor of Peter, whatever privilege he [Peter] may have obtained, because it was extraordinary and special (which could not pass over to others)” (18.19.1). In other words, positions or offices are the sort of thing that can be handed to successors, while personal excellences are not—they pertain to the individual only. Of course, no point is properly made unless Turretin can show that Bellarmine is confused and self-contradictory on the matter (18.19.2).